Choose the style you prefer, and we will engrave it with your Parkinson’s Disease diagnosis, treatment considerations, and other pertinent information. Parkinson’s disease is a progressive nervous system disorder impacting movement. Treatment typically includes medications that alleviate some of the symptoms of Parkinson’s. In some cases, brain surgery can also help alleviate some symptoms, but again, this is not a cure. Parkinson’s disease causes speech, mobility, range of motion, muscle control, balance, and posture issues. All of these can also result from head injuries. 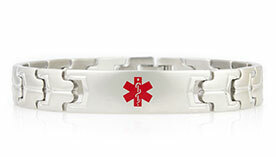 Therefore, in an emergency situation, it is imperative that EMTs and ER personnel know what your baseline and diagnosis are so that they can determine whether, for example, your speech and balance issues are new symptoms (that is, from an injury during an accident) or are part of how your Parkinson’s presents. Additionally, if you have Parkinson’s, it’s likely you will be on multiple medications, which first responders also need to be aware of when treating you. 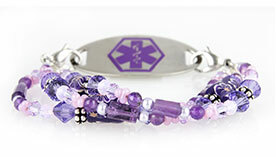 Finally, if you have speech challenges, even if you are conscious and coherent after an accident, you may be unable to self-advocate, so having an ICE (In Case of Emergency) contact on your medical ID necklace or bracelet will give those assisting you a point of contact who can fill them in on your medications, diagnoses, and current treatment plan, and it enables your loved one(s) to be reached and get to you more quickly. 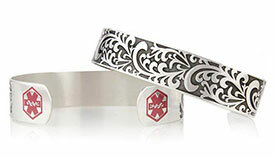 If you or someone you love has Parkinson’s disease, medical ID jewelry is a true necessity. 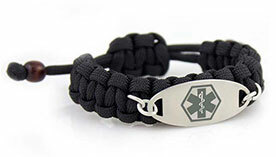 We recommend listing your name, diagnosis(es), any medications, all allergies, and multiple emergency contact numbers.